Earlier this term FdA Graphic Design and FdA Illustration students were set a live project to submit mural proposals for the college’s pop-up cafe. Students spent time developing designs with tutors, and then pitched their ideas to a panel of judges. After careful consideration, the abstract and graphical work of student ‘Kyulx’ was selected and will be applied to the cafe walls next term. At the start of this project, tutors Angela Hogg and Matthew Hawkins presented students with a brief and wall plans of the cafe space. 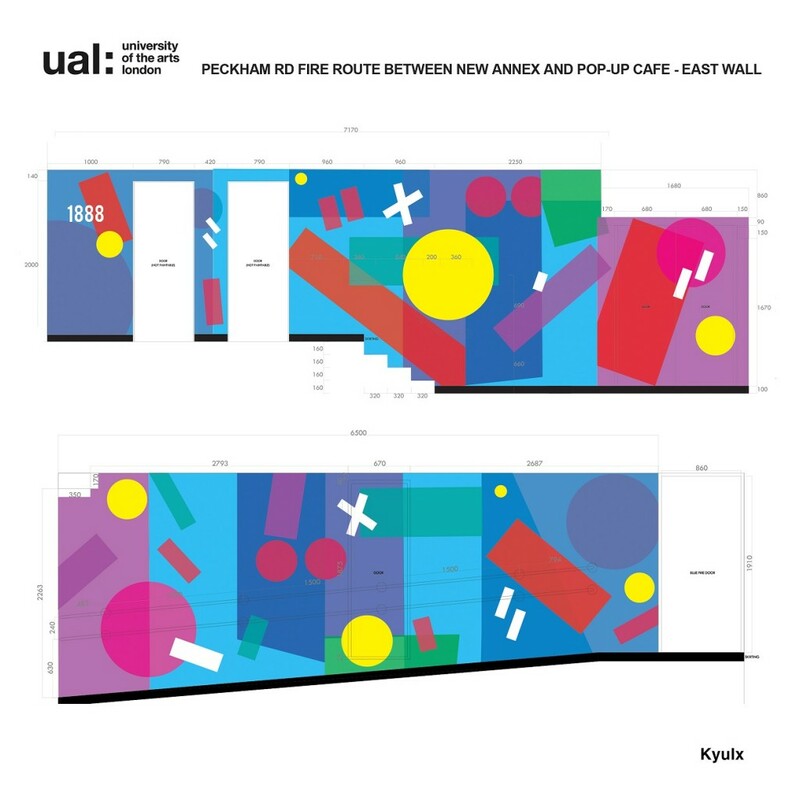 Students were requested to design a mural that reflected an element of Camberwell’s past and future as a leading art school. The brief also outlined that the selected design would be awarded £500, plus an extra £150 to cover material costs. Murals require careful planning and consideration, and for many students this was their first experience creating designs on such a large scale. Once initial ideas were drawn up, students met with tutors on a weekly basis to develop their ideas. Each pitch needed to include a budget for materials, a clear idea of method, and details of any practical difficulties that were likely to be encountered. Initial mural design by ‘Kylux’ placed on to wall plans.